Tokyo, Japan, 2019-Feb-12 — /Travel PR News/ — Beginning March 16, 2019, MOTIF RESTAURANT & BAR at Four Seasons Hotel Tokyo at Marunouchi launches a special edition afternoon tea in partnership with world-renowned luxury fashion accessories brand Jimmy Choo. 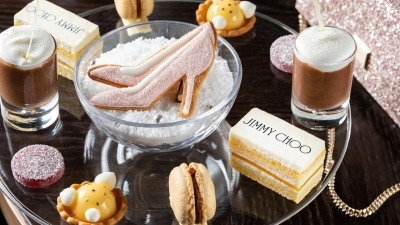 This is the first co-branded afternoon tea collaboration for Jimmy Choo in Japan. This entry was posted in Business, Food & Drinks, Hotels, Luxury, Resorts, Travel, Travel Management, Travel Services, Travelers and tagged afternoon tea, Four Seasons Hotel, Japan, Jimmy Choo, Marunouchi, MOTIF RESTAURANT & BAR, partnership, Tokyo. Bookmark the permalink.